A perfect and wonderfull wall!! Thanx for inspiration! It is so much more inspiring to make your own wallcovering than to put a wallpaper of someone elses collection on your wall. It reminds me of Princess Bunchy's bedroom walls - covered with so many bits and bobs that she has reached the door, and only the ceiling is empty, mainly because she can't reach it! you've got such a way with bits and bobs! Oh, I do love your 'bits and bobs" wall......you have definitely inspired me ! At 5.58 am no less. I loooove your bits and bobs wall! And it's just so nice you can switch some bits or bobs for another bit or another bob. bobs wall and show it on your blog to Tif' kind of thing?...oh my, i'm probably a bit overreacting on your wall...i really need to calm down when i'm visiting your blog! i don't think you've used the words bits and bobs enough in this post. can you say them again please? I love your bits and bobs wall! I always loved doing this kind of thing when I was young - you've just reminded me how much fun it is and how inspiring! Thanks! 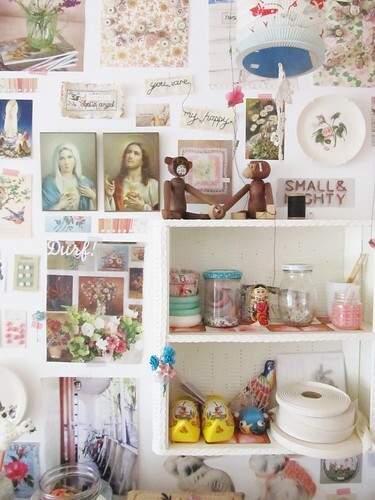 Your bits and bobs wall is perfectly peachy! I'd love one! Very cute. That would make good wallpaper. Never thought they made paper like that.....great idea. I am enjoying your blog so much!! my bits and bobs are positively beaming with your kind comments! Oh Tif I see a POSTCARD in your 'bits & bobs' wall for sure....You must have had a BALL putting this together....! wow what a clever way to use creativitiy I wouldnt mind doing something like that but of course I wouldnt know were to start!!! but what a perect work space!! I love bits and bobs just as much as I love knicks and knacks. 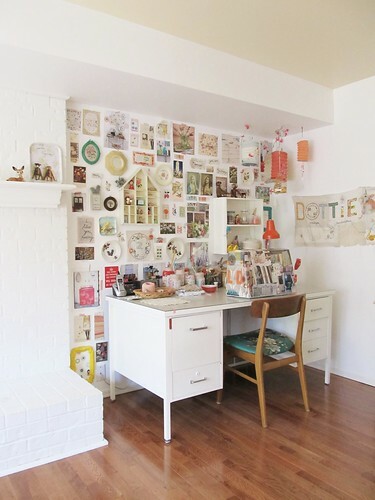 Love your 'bits and bobs' wall, looks so inspiring!! 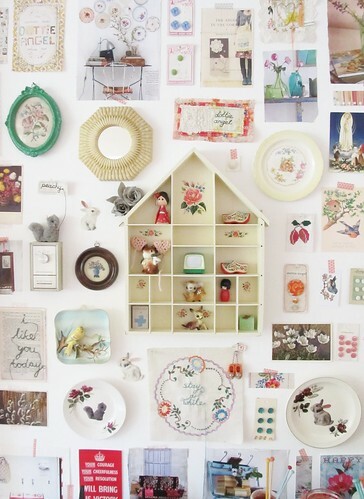 Your bits and bobs are so cute and come together well on a wall, especially a white wall. Thanks for sharing Tif! Your bits and bobs wall has brought a little sunshine to my day! Hi! Long time no comment, but my master thought I ought to let you know that your bits and bobs wall is "Found Art", of whom a well-known exponent is Peter Blake. Recent exhibition at the Holburne Museum in Bath. I said that using such highfaluting terms would put you off being you, but my master assured me that you would like to know that your wall will be worth a fortune one day. What the hell, say I. It's lovely, 'cos it's you. I especially love Mr Squirrel holding up his peachy balloon, and your little bluebird flying about. Have a fantastic weekend Tif. What a wonderful idea. Love the wall of things you love. 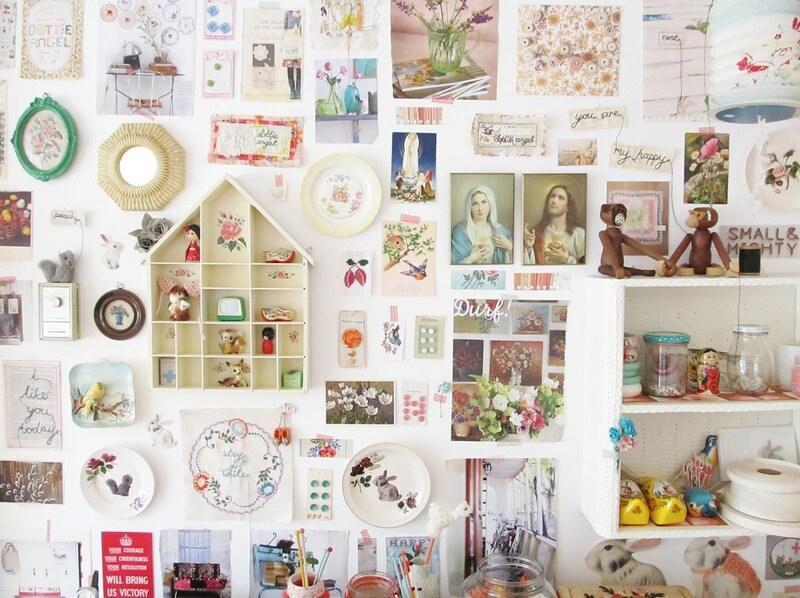 Wonderful bits and bobs wall, hope you have a lovely weekend too. Hello! I just discovered your blog and I really love it! This is a place full of inspiration and beautiful things! I love your wall, it's simply gorgeous. I have a metal wall behind my desk at school. I am going to start bitting and bobbing it up! Oh, ye lovely bits and bobs! I love your bits and bobs wall. I am so envious! my wall is just full of photos. love it! I love your bits and bobs wall...you're giving me a idea!!! Well not quite like that but something like that!!! Hey there Dottie - love your work, am purchasing your latest book and love to read your stories. I love your 'bits and bob' wall! I haven't had a wall that fun in I don't know how many years!! 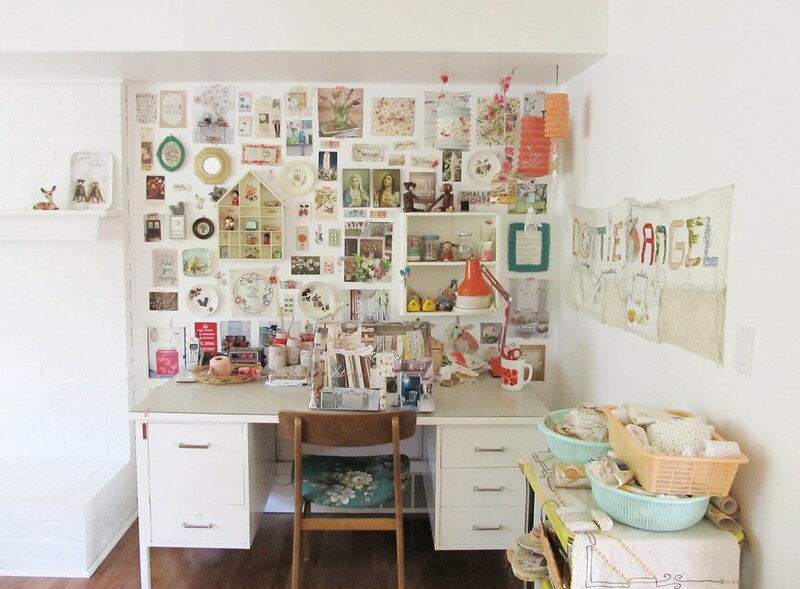 How very inspiring, I love your peachy bits and bobs wall (and your peachily peachy blog). Do you use blu tac to stick up the bits and bobs? Love it, especially on the white wall. Jealous of the Amsterdam excursion. That wall is FULL of inspiration! Its wonderful. Even had to pin the image to my pinterest to keep you inspiring idea at hand. Hope you dont mind! That makes your wall so beautiful. I could spend several minutes looking at your bits and bobs, because they are so fun! Great inspiration for sure! wilhelmine, so happy to hear you went there, isn't it just the peachiest bit of london. hurrah hooray! found art wall makes me most happy, thank you Colin the computer! Love the bits as well as the bobs. I just found your darling blog and will plan to be back lots! "granny dottie", may just have to do the same!